Updated Nov. 6 @ 1:20 a.m.
A new European communications satellite was launched into space Wednesday, bound for a premier orbital location that broadcasts over 1,000 channels to 93 million homes in 35 countries. Russia's heavy-lift Proton rocket roared away from its fog-shrouded launch pad at the Baikonur Cosmodrome in Kazakhstan at 2044 GMT (3:44 p.m. EST) carrying the ASTRA 1M satellite. The six main engines ignited at liftoff to blast the 19-story rocket into the nighttime sky from desert steppes of Central Asia. After first stage burned out and separated two minutes into flight, four engines aboard the second stage fired for three-and-a-half minutes. The Proton's third stage then came to life for its four-minute job, during which time the protective payload fairing shielding satellite was let go after reaching the upper atmosphere. The Proton booster's three core stages delivered the upper stage and the payload into an initial suborbital trajectory by T+plus 10 minutes. At that point, the Breeze M upper stage took over and performed a series of five burns over nine hours that methodically propelled the 11,730-pound cargo into the desired orbit for deployment, which was targeted to have a low point around 3,100 miles, high point of 22,235 miles and inclination of 21.5 degrees to the equator. 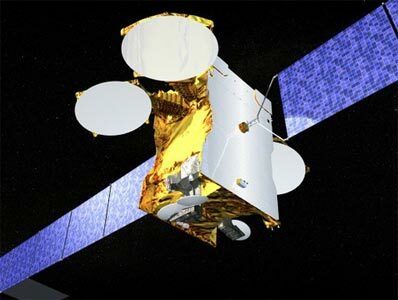 ASTRA 1M arrived in its geosynchronous transfer orbit and separated from the launcher around 0556 GMT (12:56 a.m. EST), beginning a 15-year mission to relay direct-to-home programming and high-definition television across Europe and North Africa for the SES ASTRA firm of Luxembourg. The EADS Astrium-built satellite uses the Eurostar E3000 design and features three dozen Ku-band transponders, three deployable antennas and a pair of power-generating solar arrays that stretch nearly 115 feet tip-to-tip. In the coming days, the satellite's onboard engine system will complete the task of circularizing the orbit to an altitude of 22,300 miles along the equator, and controllers at the Astrium center in Toulouse, France will guide the craft into a slot at 19.2 degrees East longitude. That orbital slot is crucial to the ASTRA service. The addition of ASTRA 1M will allow operators to replace older craft currently operating there and relocate them to the neighboring 23.5 degree East position. In all, the SES ASTRA fleet includes 16 satellites in five orbital locations transmitting 2,433 television and radio channels to 117 million homes. Wednesday's launch is the 7th time an ASTRA satellite had flown aboard the Proton rocket, dating back to the Russian vehicle's April 1996 entrance into the commercial launch service business. "SES and the Proton launch team are very experienced partners. Since the launch of ASTRA 1F on Proton in 1996, we have developed strong and reliable relationships with ILS and Khrunichev," Ferdinand Kayser, president and CEO of SES ASTRA, said in advance of the ASTRA 1M mission. The U.S.-based International Launch Services oversees Proton's commercial satellite deployment flights for rocket-maker Khrunichev State Research and Production Space Center of Moscow. This was the fifth of six planned launches in 2008 and the 48th overall. ILS says its backlog has 23 launches planned over the next five years. The next mission is planned for December carrying the Canadian Ciel 2 broadcasting spacecraft.